Shogun-ki: Defenders, Victims, Avengers: Turnbull's "Samurai Women"
Defenders, Victims, Avengers: Turnbull's "Samurai Women"
While the female warrior is a staple of chanbara films, manga, and anime, there's very little in the way of books that examine the role of women in Japanese warrior society (particularly in English). 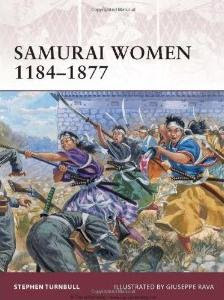 The ever prolific Stephen Turnbull has addressed this shortage with his newest effort "Samurai Women 1184-1877" (which despite the title actually covers the period from 170 to 1877). Whether in their capacity as castle defenders, victims of warfare, or avengers pursuing a vendetta, Turnbull examines the impact that women had upon the violent world of the samurai. We'll go over the book's shortcomings first since we'd like to end on a positive note. Simply using the term ‘samurai’ with ‘women’ casts Turnbull in a bad light-it seems he’s unaware that the Japanese use ‘samurai’ as a gender specific term that can only be applied to males (those who want the details can read about it here). Onnamusha, buke women, and other terms would be more appropriate here. While I would have to reread the book to be 100% positive, I believe Turnbull never explains that 'Gozen' is not a proper name but rather just another word for 'woman' or 'lady'. This might puzzle some readers who will come away thinking that virtually all the female warriors of yore shared the same given name! The careless errors that crop up on a regular basis in Turnbull’s other books waste no time in showing up in Samurai Women. For example, he devotes two lines in the main text to Hosokawa Gracia (possibly the best known ‘samurai woman’ in the west besides Tomoe Gozen). One is a picture caption, one is in the main text-and he gets them both wrong. The caption reads “Hosokawa Gracia is revered for the fidelity that she showed to her Christian faith in spite of the initial opposition from her husband, and later his disgrace and death”. As Hosokawa Tadaoki outlived Gracia by several decades, it appears Turnbull instead is thinking not of her husband but her father Akechi Mitsuhide (who of course was labeled as a traitor and disgraced for his attack on Oda Nobunaga and his subsequent death at the hands of peasants). The selection in the main text reads “This was Hosokawa Gracia, the staunchly Christian wife of Hosokawa Yusai”-but of course, her husband was Hosokawa Tadaoki with Yusai being his father. These are the types of errors that make one speculate if Turnbull actually proofreads his work or even has someone else glance over his manuscript for accuracy. Turnbull’s tendency to be highly uncritical of his sources and accepting Edo period and earlier legends at face value is on full display as well. Nowhere is it mentioned that most Japanese historians consider celebrated female warrior Tomoe Gozen to have been nothing more than a legend. She appears in no contemporary documents, histories such as the Azuma Kagami, the records of the Wada family, or in the registers of the temples she was alleged to have joined late in life. He fails to mention that the Genpei Seisuki (the basis for the story of Tomoe becoming Wada Yoshimori’s concubine) is an ‘expanded version’ of the Heike Monogatari with many fictional elements added. Instead, it appears Tomoe was birthed in the Heike Monogatari through the efforts of pro-Minamoto/Hojo historians to discredit Kiso Yoshinaka. In many subtle ways the Heike chroniclers cast aspersions on his fitness to rule, ranging from referring to him as ‘Kiso’ rather than ‘Minamoto’ to always depicting him in the company of women (the story even has Kiso remarking that to die in the company of a woman would be dishonorable). Elizabeth Oyler has a fascinating examination of this in her book ‘Swords, Oaths, and Prophetic Visions’ for those who wish to learn more. Similarly, the story of Akechi Mitushide’s mother being killed by Hatano samurai after Oda Nobunaga breached their agreement with Mitsuhide is presented as fact. Instead, this appears to have no basis in reality and was first seen in an Edo period play as an attempt to explain Mitsuhide’s motivation for turning traitor. There are records of her surviving past 1574 (the supposed year of the incident) along with letters written to and by her. There’s more along these lines, but these examples should suffice. It’s also odd that Turnbull neglects several of the more dramatic episodes involving ‘samurai women’. Although it’s mentioned that the ‘Satsuma rebels under Saigo Takamori had a few women in their ranks’ (during the Satsuma Rebellion of 1877), the many contemporary accounts of large groups of them fighting at the siege of Kumamoto castle are ignored (we would have been interested in reading more about this, since there seems to be a question about whose side they actually fought on). Tachibaba Ginchyo’s defiance of Kato Kiyomasa during the Sekigahara campaign while she was a nun is depicted, but Turnbull fails to mention that she was unique in Japanese history. Ginchyo was the only female daimyo lord in Japanese history, being installed in that position by her father who lacked a male heir (she lost this position to her husband Muneshige after their marriage-and Muneshige later divorced her. Talk about ingratitude!). Several short accounts of ‘female horsemen’ in the full version of the Taiheiki are not brought up. Another of Kiso Yoshinaka’s attendants who supposedly fought and died at the decisive battle of Kurikara, Aoi Gozen, isn’t examined. As noted earlier Hosokawa Gracia rates barely a mention. Even some recent archaeological discoveries that could have an important bearing on the role of women in combat are brought up only in passing (such as excavations at head mounds located near battlefields that contain approximately 33% female heads according to DNA testing). We would have liked to have seen much more done with the latter (even if only referencing a source), as this has the potential to redraw the parameters of the female warrior. Finally, in an effort to get the maximum drama from his subject, Turnbull engages in some rather baseless speculation both in the body of the text and in his interpretation of certain images. For example, he states that "the samurai woman as a fighting warrior, by contrast, appears to be virtually non-existent" and follows that by stating "they...allow us to regard the exploits of female warriors as the greatest untold story in samurai history". However, given that Turnbull is unable to find enough material to fill the approximately 32 pages of text in the book with the exploits of warrior women, it seems the 'female warrior' (at least on the open battlefield) must still be considered largely a myth. This is a theme Turnbull comes back to again and again, but he fails to provide evidence to back it up. For example, the best he can do for contemporary images of 'female warriors' are a woodblock from 'Hojo Godaiki' and 'Boki Ekotoba' (a picture scroll from 1351). The woodblock shows 'trophy heads' lined up after the Hojo capture of Fukane castle, and Turnbull claims several of the heads appear to be female. He doesn't identify which heads he has in mind, but the ones he might be thinking are female clearly have the hairstyles of male pages. Turnbull also states that a figure seen in the Boki Ekotoba scroll is likely a woman because "the features are very feminine with rouged cheeks and painted eyebrows, and by comparison the faces of all the other characters are coarse and masculine". Well, not really-all of the characters display rouged cheeks and painted looking eyebrows. The figure appears to be a youth or page (Turnbull does list this as being possible), with the only real facial differences being that he still has all his hair (not having yet taken vows) while the other monks have shaven heads. Now let's move on to the book's strong points. Turnbull does a good job of providing background on the important roles that women played both in the political (both in marriage politics and working behind the scenes) and economic (by managing the estates and affairs of a samurai household) realms. These were women like Hojo Masako, Minamoto no Yoritomo's wife who was as feared and ruthless as any male leader of the time. Many of the early female Emperors are mentioned, including the mythical Empress Jingu (who may or may not have existed) who was said to have led an army that conquered Korea around the start of the third century AD. Another early female leader, Himiko (mentioned in a Chinese account in 297) is also examined. By far the most impressive section of the book is where Turnbull examines the role women played in castle sieges. This is where virtually every reliable account of women participating in warfare comes from. Women were routinely left in charge of the defense of castles while their lords were away, and even took an active part in the action when their husbands were present. Turnbull has well-documented instances from Hangaku Gozen's defense of Torisaka Castle in 1201 to the woman of the Joshigun at the siege of Aizu-Wakamatsu Castle in 1868. While women generally performed support duties such as extinguishing fires, loading guns, making bullets, cooking food, caring for the wounded, and even preparing trophy heads for viewing, there are many accounts of them taking up arms and even sallying forth from the castle to confront the enemy. A common theme is that of a woman who would don her husband's armor to inspire the troops, in effect 'standing in' for the lord. Some of the accounts are comical and heartbreakingly tragic at the same time, such as occurred at Tsuneyama Castle in 1577. Led by Ueno Tsuruhime of the Mimura, a group of 34 women charged out of the castle and attempted to engage the besieging Mori troops in conflict. However, the Mori samurai refused to kill women and tenaciously avoided combat, frustrating the women who returned to the castle and committed mass suicide. A much different result was to be found at Aizu Wakamatsu in 1868. Nakano Takeko and a large group of women left the castle and charged into the lines of the new Imperial army. While the Imperialists instructed their men to take the women alive (likely more for some nefarious purpose than out of compassion), the women had no such compunction, slaughtering many of the Imperial troops before most of them were gunned down. There are many other excellent accounts such as at Imayama in 1570, Tsurusaki in 1586, Hondo in 1589-90, Omori in 1599 (where women operated a catapult), several actions during the Sekigahara campaign of 1600, and more. Perhaps our favorite account was of Yamamoto Yaeko, who was the daughter of an Aizu gunnery instructor and who replaced him when he was killed during the fighting in 1868. Brandishing a brand new Sharps repeating rifle, she not only fought with the men but also survived the battle, living to found Doshisha University in Kyoto. Perhaps Turnbull's greatest strength is his ability to bring to life the legends of long ago, and this is some of his best work in that area. There's also an intriguing 'battlefield' account of Sengoku period female warrior Tsuruhime of Omishima (no relation to the Tsuruhime mentioned above). Tsuruhime's exploits against the Ouchi around 1541 (both on land and on the sea) are perhaps the only reliable accounts in Japanese history of a woman participating in open field battle. Oddly enough, Tsuruhime wasn't even a member of the buke class-rather, she was a shrine maiden who proclaimed herself the avatar of Mishima Myojin. The high point of her career came when she boarded the flagship of Ouchi general Obara Nakatsukasa No Jo and cut him down. Turnbull includes an image of the altered armor that is attributed to Tsuruhime and that is still housed in the Oyamazumi Shrine. Turnbull fills out his accounts by relating many of the atrocities suffered by women as victims of war, with some particularly grisly accounts of them being pierced through the hands, tied to ships, and used as human shields by the Mongols during their invasion of Japan in 1274. Threats of mass suicide were also commonly used by women against invaders-one wouldn't think that would be much of a deterrent, but the courage showed by the women sometimes impressed the invaders enough so that they would abandon their assault out of respect. He also brings up sanctioned Edo period vendettas-out of 100 recorded vendettas, 14 were carried out by women. One of these is examined in detail, showing how the two daughters of a farmer, Miyagino and Shinobu, killed the samurai who had murdered their father. While their story has been greatly embellished over the years ala the 47 Ronin, they used a naginata along with a chain and sickle to dispatch their foe. It's also interesting that the only instance during the Edo period where a 'retainer' took revenge for their 'lord' (besides the fabled Ronin) involved a lady-in-waiting who killed a woman that had forced her lady into suicide. About half of the 64 page book is devoted to photos, reproductions of woodblock prints, portraits, and also some excellent plates by artist Giuseppe Rava. In our opinion, Rava's plates are among the best ones seen in Osprey's Japanese samurai history line-they're quite dynamic and don't 'glamorize' their subjects by making them look like schoolgirl teen idols. Turnbull's images are quite good, showing statues and museum pieces as well as woodblocks and scrolls. Unfortunately, there are errors and exaggerations here too. Turnbull identifies a photo of a woman playing a hand drum to accompany Oda Nobunaga's performance of 'Atsumori' before the battle of Okehazama as 'a servant girl' when in fact it's his wife Nohime. There are the spurious identifications mentioned in a prior paragraph. One of Rava's plates shows Hangaku Gozen charging out of Torisaka Castle on horseback slashing her way through a group of foot retainers, but the Azuma Kagami states that she remained inside the castle throughout the siege until felled by an enemy arrow. It sure looks great, though! "Samurai Women", despite Turnbull's hyperbole, does little to change the model of Japanese female warriors that has developed over the years. In short, there's virtually no reliable evidence that women were professional soldiers or standing troops in a regular army. However, when it came time to defend the homelands in the form of castle sieges, they routinely became an active part of the defenses. While they usually joined servants and children in support services, there are many records of them taking a more direct role in the fighting-and by all accounts, acquitted themselves well in both roles. Women (both of the buke and commoner classes) also were involved in a large percentage of vendettas during the Edo period, proving that they didn't shy away from conflict when it was called for. Finally, during the closing days of the Tokugawa Shogunate, the shifting boundaries between classes and gender roles gave women the opportunity to become more active in many fields, including warfare. However, the new Meiji government reversed many of these gains and restricted their new conscript army to males. So, in the final analysis, is Turnbull's book worth a read? Yes, it is. Despite the grab bag of errors and speculation, the positives outweigh the negatives-and like many of Turnbull's books, it's regrettably the only work in English on the subject. Many of the accounts will be new to Western readers and his bibliography will give many new directions to explore. As always, Turnbull's selection of pictures is excellent and the color plates are among the best done for an Osprey 'samurai' book. And what the heck-it's less than $13. It's a small price to pay to learn about the women who defended their homes, were victimized by war, and who avenged the deaths of their families. While it isn't quite "the greatest untold story in samurai history", it certainly ranks with the more interesting ones-and merits further study. I hadn't realized that there were any examples of women fighting at all, really, let alone a female daimyo. I suppose it makes sense, perhaps, when you think about it, that the women might fight when their home, their castle, is under siege. Though, at the same time, I had always imagined another man being left in charge of the castle in the lord's absence, and he and his men defending the castle, forcing the women to stay hidden or to somehow escape, or something to that effect. I've learned a lot just from this review. Thanks for naming so many examples... I'm really quite intrigued now to learn more about some of these figures and events. Usually it was a male subordinate who was left in charge of a castle, but especially in the case of vassals of lower rank who might have lacked a qualified subordinate who they could fully trust (either skill-wise or loyalty-wise), it made more sense for them to put their wives in charge-they were already responsible for monitoring much of the day to day activity. Turnbull's careless errors are beyond sloppy. Gracia's husband Hosokawa Tadaoki (b.1563) was the same age as Gracia and he outlived her for four decades. Without checking names or birth dates, he refers to Gracia's father Akechi Mitsuhide as her husband. Secondly, Turnbull mistakes Tadaoki for his own father Fujitaka (who took the name Yusai when he became a monk after Nobunaga's death). Sounds like Turnbull needs a village to proofread his books. I always appreciate Tables of Events, Family Trees or Short Bios of historical figures in the history books or the historical fiction I read. its funny he mention's Tsuruhime finally ,I e mailed him over 10 years ago after i saw the film Tsuruhime Denki and asked him if he knew about the Shrine Maiden that fought against Sui Harukata and he told me ,he had never heard of her . Anyway errors and all ,its still good to have a book on this subject though i know two readers who will be 100% convinced this is all true . Ain't that the everlovin' truth. Thankfully the weird wild wave of historical buffoonery that swamped the NINjA Hangout has receded from the world of logic. A good review, as someone who purchased the book. As most of Turnbull's books not related to religion it's an excellent springboard into a subject, but it shouldn't be used as a serious source. I know this is a late comment- a very, very late comment- but I too was rather disappointed by the lack of any mention of Ginchiyo being clan head. Even more disappointing is the lack of mentioning Ii Naomasa's adoptive mother, Ii Naotora, being the head of the clan from a few weeks after the Battle at Okehazama (which is where her father died) until her death in 1582. She held the title of head of her clan for longer than many other Sengoku daimyo ever did, and to my recollection she actually defended her castle quite well from attacks by the Takeda several times. In fairness, Mr. Turnbull doesn't seem to pay much attention to non-English sources, and I didn't know of Naotora's existance until the year before last. Still, it's his job, so if he's written a book on samurai women, Naotora should be present.